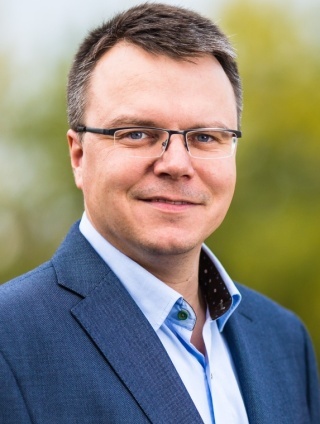 HomeAboutPersonnel Prof. Michal Otyepka, Ph.D.
Physical-chemical properties and reactivity of graphene derivatives and 2D materials, non-covalent interactions to 2D materials (2D chemistry). Interactions of drugs, antioxidants, and cytochrome P450 with biomembranes. Coauthor of software projects for analysis of molecular channels MOLE and CAVER 1.0. Molecular dynamics of biomolecules and complex molecular systems, force field development, QM/MM methods and their applications in biomolecular research. Author or co-author of more than 200 papers in international journals, three book chapters and one book. More than 9000 citations; H-index 47. Urbanová V, Holá K, Bourlinos AB, Čépe K, Ambrosi A, Loo AH, Pumera M, Karlický F, Otyepka M, Zbořil R: Thiofluorographene-Hydrophilic Graphene Derivative with Semiconducting and Genosensing Properties. Adv. Mater., 27(14), 2305-2310, 2015. Bakandritsos A, Pykal M, Blonski P, Jakubec P, Chronopoulos DD, Poláková K, Georgakilas V, Cepe K, Tomanec O, Ranc V, Bourlinos AB, Zbořil R, Otyepka M: Cyanographene and Graphene Acid – Emerging Derivatives Enabling High-Yield and Selective Functionalization of Graphene. ACS Nano, 11(3), 2982–2991, 2017. Tuček J, Blonski P, Malina O, Pumera M, Chua CK, Otyepka M, Zbořil R: Morphology‐Dependent Magnetism in Nanographene: Beyond Nanoribbons. Adv. Funct. Mater., 28(22), 1800592, 2018. Matochová D, Medved M, Aristides B, Steklý T, Zbořil R, Otyepka M: 2D Chemistry – Chemical Control of Graphene Derivatization. J. Phys. Chem. Lett., 9(13), 3580–3585, 2018. Medved M, Zoppellaro G, Ugolotti J, Matochová D, Lazar P, Pospíšil T, Bakandritsos A, Tuček J, Zbořil R, Otyepka M: Reactivity of fluorographene is triggered by point defects: beyond the perfect 2D world. Nanoscale, 10, 4696-4707, 2018. Bakandritsos A, Chronopoulos DD, Jakubec P, Pykal M, Čépe K, Steriotis T, Kalytchuk S, Petr M, Zbořil R, Otyepka M: High‐Performance Supercapacitors Based on a Zwitterionic Network of Covalently Functionalized Graphene with Iron Tetraaminophthalocyanine. Adv. Funct. Mater., 28(29), 1801111, 2018. Banas P, Hollas D, Zgarbova M, Jurecka P, Orozco M, Cheatham T, Sponer* J, Otyepka* M: Performance of Molecular Mechanics Force Fields for RNA Simulations. Stability of UUCG and GNRA hairpins. J. Chem. Theor. Comput, 6 (12), 3836-3849, 2010. Galindo-Murillo R, Robertson JC, Zgarbová M, Šponer J, Otyepka M, Jurečka P, Cheatham TE: Assessing the current state of AMBER force field modifications for DNA. J. Chem. Theory Comput., 12(8), 4114–4127, 2016. Šponer J, Krepl M, Banáš P, Kührová P, Zgarbová M, Jurečka P, Havrila M, Otyepka M: How to understand atomistic molecular dynamics simulations of RNA and protein– RNA complexes? WIREs RNA, 8(3), e1405, 2017. Šponer J, Bussi G, Stadlbauer P, Kührová P, Banáš P, Islam B, Haider S, Neidle S, Otyepka M: Folding of guanine quadruplex molecules–funnel-like mechanism or kinetic partitioning? An overview from MD simulation studies. Biochim. Biophys. Acta, Gen. Subj., 1861(5), 1246–1263, 2017. Šponer J, Bussi G, Krepl M, Banáš P, Bottaro S, Cunha RA, Ley AG, Pinamonti G, Poblete S, Jurečka P, Walter NG, Otyepka M: RNA Structural Dynamics As Captured by Molecular Simulations: A Comprehensive Overview. Chem. Rev., 118(8), 4177–4338, 2018. Di Meo F, Fabre G, Berka K, Ossman T, Chantemargue B, Paloncýová M, Marquet P, Otyepka M, Trouillas P: In Silico Pharmacology: Drug Membrane Partitioning and Crossing. Pharmacol. Res., 111, 471–486, 2016. Chantemargue B, Di Meo F, Berka K, Nicolas P, Arnion H, Essig M, Marquet P, Otyepka M, Trouillas P: Structural patterns of the human ABCC4/MRP4 exporter in lipid bilayers rationalize clinically observed polymorphisms. Pharmacol. Res., 133, 318-327, 2018. Šrejber M, Navrátilová V, Paloncýová M, Bazgier V, Berka K, Anzenbacher P, Otyepka M: Membrane-attached mammalian cytochromes P450: An overview of the membrane’s effects on structure, drug binding, and interactions with redox partners. J Inorg Biochem, 183, 117-136, 2018. Berka K, Hanak O, Sehnal D, Banas P, Navratilova V, Jaiswal D, Ionescu CM, Svobodova Varekova R, Koca* J, Otyepka* M; MOLEonline 2.0: Interactive Web-based Analysis of Biomacromolecular Channels. Nuc. Acids Res., 40(W1), W222-W227, 2012. Pravda L, Sehnal D, Svobodová Vařeková R, Navrátilová V, Toušek D, Berka K, Otyepka M, Koča J: ChannelsDB: database of biomacromolecular tunnels and pores. Nucleic Acids Res, 46(D1), D399–D405, 2018. Pravda L, Sehnal D, Toušek D, Navrátilová V, Bazgier V, Berka K, Svobodová Vařeková R, Koča J, Otyepka M: MOLEonline: a web-based tool for analyzing channels, tunnels and pores (2018 update). Nucleic Acids Res, 46(W1), W368–W373, 2018.